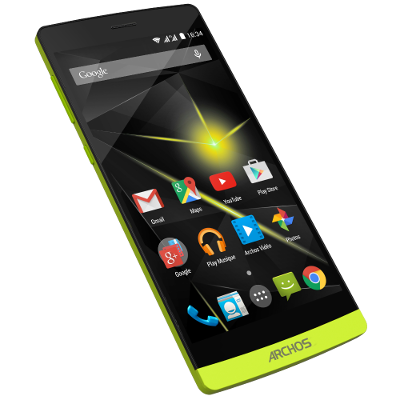 Here is a first rooted custom firmware release based on Archos firmware update from December 27th, 2012. Fix an issue with several buttons pressed simultaneously. Fix an issue with the display flickering. Fix an issue with Google talk no sound on loudspeaker on video chat. Please do not reupload or mirror this file. Flash only with Rockchip Flasher tool, use Restore button. Quick firmware flashing update procedure, thanks to nubis. I have successfully flashed it, coming from stock firmware 1.0, using Win7/64bit. connected tablet to usb, switched off the tablet, then pressed vol+,vol-, poweron at the same time. The tablet was still showing me a black screen (no archos logo), but Win7 complained suddenly about a missing driver. I went into the device manager, used the rockchip driver (amd64/win7) and proceeded to start the flashing tool. If your device proceeds automatically to boot Android, then you have do something wrong. Then (still with a black screen on the tablet) I selected the rooted firmware, clicked on "restore" and waited a few minutes. The flash completed successfully. It will set everything back to default, this means all apps/settings are gone. Then it rebooted automatically. Then I checked for root access – first SuperSU wanted an update, then Check Root didn't want to show me a root success, but then I remembered to turn on usb debugging on the tablet. 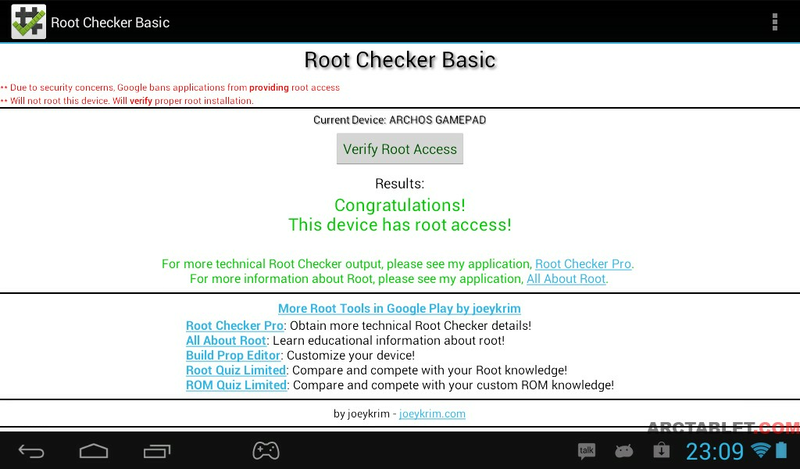 Afterwards, checkroot confirmed that the tablet is rooted! This firmware has been confirmed to work by several forum users. You should be able to flash this test firmware safely and flash back the stock firmware from Archos if things go wrong. Feedback is welcome. WOW!!! Thanks a lot! I'm dying to try it! If you need someone to test anything just tell me. when we will be able to download the root firmware? When we are done with the firmware modifications and tests, probably a couple of days. The new firmware seems to come pre-rooted and is easy to modify. But you can already install the firmware rooted? has released a new firmware archos, I can easily update and wait for the root or if I upgrade then I can not do the root? Here is a first root custom firmware test release based on Archos firmware update from yesterday. Please note that this firmware is built the same way as previous firmware shown in post #1, but I can't test it as I don't have my Archos GamePad with me. Downloading right now... How I can put the gamepad into recovery mode??? the_jako but the firmware you mount it now? let me know how it goes! I will let you know, but right now I dont know how to put the Gamepad into Recovery mode to flash it. Could you please help me with this? I'm not sure but I think that if you reboot the tablet by pressing and holding the power button and the volume + button and when it leaves the word archos leave only the power button.